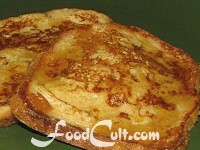 Eggs &amp; Breakfast - Free, Easy Recipes @ FoodCult.com - A Place for Galganov's Recipes and More - Food Matters! What makes something breakfast? We think it's "tradition". Of course, tradition is fluid. It shifts and changes with the times ... even more than with family. Today many cities feature "all-day-breakfast" restaurants. What is served there? Pancakes and creps, eggs, sausages, toast, waffles, bacon, home fries, assorted syrups and jams... Morning Foods. Some like a muffin and a coffee (though not, so much, dessert muffins). On mornings we went skiing we would breakfast on anything including steak and eggs with baked beans - big, energy delivering breakfasts. Today, breakfasts are more modest except for left-over pizza--a treat cold or reheated. Sometimes, breakfast is a nice loaf of bread - fresh or toasted with home made butter and/or your favourite spread. Breakfast is your choice. It can be high-powered, high-protien brain food or a simple slice of dry bread with a favoured morning beverage. What ever you choose... Enjoy your breakfast.